Voices Empower, founded by Alice Linahan, a politically-active Texas mom, works in the trenches of the grassroots movement to break the reliance just on the media for news and information. Voices Empower is on track to re-define the meaning of “boots on the ground.” Specifically, by implementing a communication team strategy that gives activists the tools to “ENGAGE” and change hearts and minds vs. just a CLICK “LIKE” mentality on social media. Alice is the author of…….. 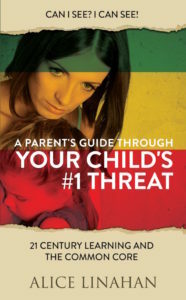 Your Child’s Number One Threat: 21st Century Learning and the Common Core. Alice Linahan is an intrepid activist, politically-active Texas Mom who has worked hard in the trenches of the Grassroots movement. Alice launched Voices Empower in 2011 in response to identifying an urgent need to engage the passive majority of voters at both the National and State level during the primary process. Voices Empower has quickly risen as an organization playing an integral part in holding politicians and the progressive/liberal media accountable by getting real stories out to Americans across the country. She is on track to re-define the meaning of “boots on the ground.” Specifically, she is implementing a communication team strategy that gives activists the tools to “ENGAGE” and change hearts and minds vs. just a CLICK “LIKE” mentality on social media sites; therefore, the new paradigm created by Alice Linahan takes “boots on the ground” to social media platforms strategically and effectively. Citizen journalists are driving the narrative and Alice Linahan is playing a national role in its impact on the electorate. Currently, Alice is working on projects at both the state and national level to save our Country from attacks within our own borders. Currently, Alice is working on projects at both the state and national level to save our Country from attacks within our own borders. Alice Linahan speaks publicly throughout the country to educate the public on the truth about what is happening in Education and the unilateral mental disarmament of the next generation of voters in America. Alice has been published in such publications as Focus on the Family’s Citizen Magazine and is also Vice President of WomenOnTheWall.org, an organization working on building a safe and prosperous Texas and America for our children and grandchildren to thrive in.